When you start helping Rowan with the Sprite Tree, the farm you live on will have a Chicken Barn and an Animal Barn. There won't be any animals to care for though, but once you earn enough money you can buy some young animals from Hunter's Animals in Chestnut Town. Hunter only sells baby animals (no adults). A baby chicken costs 2000 G, a baby cow costs 10,000 G, and a baby sheep costs 10,000 G. Hunter gave you all the animal care tools you'll need when you first met him. After you download the 1.5 patch, Hunter will sell baby Brown Chicken (3000 G), baby Cotton Sheep (15,000 G), and baby Brown Cow (15,000 G). A baby cow will grow up after 15 days, a baby sheep after 12 days, and a baby chicken (chick) after 7 days. Once you've named your new farm friend it will live in the appropriate barn. The Chicken Barn can hold up to 5 chickens, and the Animal Barn can hold a 5 animals, which includes your pet horse if you chose to buy one. An Animal Barn Upgrader expansion is available from Brutus' Blacksmith that costs 40 Softwood Lumber, 40 Hardwood Lumber, 5 Orichalcum, and 24,500 G. The upgrade will expand the number of livestock you can keep in your Animal Barn to 7. There is NO way to sell an animal back to Hunter. When the version 1.5 patch was released on December 19, 2016, Hunter started to buy animals back from you. He also sells new animals. Each day you will give your animals feed, which can be bought from Hunter's store. All of the animals eat the same type of feed. The quality of the feed (normal, Great, or Delicious) will help to increase the chances of getting better quality products from your animals. You can also grow Grass on your farm by buying the seeds from Sam's Shop for 30 G each. Grass matures in 5 days and does not need to be watered, but doing so will help to prevent it from wilting as it grows. Once it has matures you can pick the grass to use as animal feed or you can leave it full grown for your Cows and Sheep to graze on when you let them outside by using the Bell attached to the exterior of the barns. Unfortunately, once the Grass matures it will die after 3 days if you don't harvest it. You can also raise your music note level with the animals. Pick up the chickens and place them back down to raise their music notes. 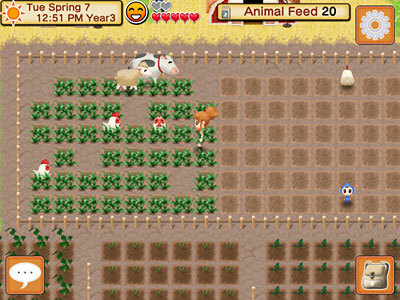 With cows and sheep, you will pet them by tapping on each one. Your livestock animals will also become dirty every few days, so you will brush them automatically before tapping to pet them. As long as you keep your animals happy, you'll be able to collect products from your farm animals. Chickens will lay eggs every day, and cows will produce milk. Sheep will produce wool every 3 days. The brown chicken will lay candy eggs every day, the cotton sheep produce cotton candy wool every 3 days, and the brown cows will produce milk every day. For chickens, the eggs can be collected from the nesting boxes in the back of the poultry barn. There's enough nesting boxes available that if you happen to forget to collect the eggs one day, the chickens will just use the remaining nesting boxes to lay more eggs for you. The livestock animals need to eat before you can collect their products. Put food in the feed trough if you haven't done so already. Animals will finish eating at the top of the clock hour (e.g., 10:00, 12:00, 2:00, etc. ), and after that you can tap on them to collect their products. To breed cows and sheep, buy Miracle Potions from Hunter's Animal Shop for 8000 G. The same potion will be used for both animals. Select the potion from the Cooking section of your bag and give it to the animal. It will immediately look like it is sleeping. The next morning you'll find the pregnant animal in the bedding stalls inside the barn. You won't be able to pet, brush, graze, feed, or collect products from it. The animal will be pregnant for only 5 days. In the morning of the fifth day, Hunter will stop by your farm and ask you to give the new baby a name. Only one animal will give birth on a specific day. Any additional births scheduled to happen will get bumped to the next available day. 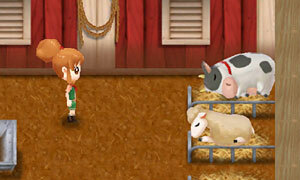 If an animal birth happens on a stormy day, Hunter taking you to the barn will bypass the "weather is horrible today!" message when you typically try to leave your house. You can do all of your farm chores, including visiting town shops, until you go back inside your farm house. If you try to leave to go back outside, the game won't let you leave the house because of the bad weather. For chickens, select an egg (any quality) from your bag, hold it in your hands, then select the nesting box in the upper-right corner inside the Chicken Barn. The egg will hatch in 9 days, and then the baby chick will take another 7 days to mature into a chicken. Animals will die once they become old enough. Hunter will visit your house in the morning to let you know that an animal has passed away. Reloading to the night before and going back to bed won't change the animal's lifespan outcome. Unlike animal births, multiple animals can die on the same day. Chickens pass away at 3 years old.